The most valuable recyclable product the demolition contractor reveals is the land underneath a building, particularly when it is located in South Boston, one of the hottest real-estate markets in the country. To highlight this, we were recently called upon by Sea and Shore Contracting, to carefully dismantle the roof and internal structure of a former contractor’s garage in South Boston. The garage spanned between East 5th and 6th Streets in a heavily-residential area. Prior to the start of the dismantling work, Sea and Shore installed augured piles and a shoring system to support the brick walls of the garage, which were to remain in place after removal of the remaining structure. We provided some hand labor, working from manlifts, to bring the exterior brick walls to a new desired elevation. Interestingly, the piling and support system was engineered to allow excavation within the building footprint for planned underground parking. Parking spaces created off-street and below grade are an extremely valuable component to this project. Using a combination of careful manual and mechanical methods, we separated structures from the perimeter walls to remain and lowered small sections of roof and truss to the ground. Sorting of all building components for recycling took place within the building footprint. The congested nature of this residential area did not allow for on-street truck loading, so the crew created access for haul trucks to the footprint by removing building bays in succession. There were four streams of materials generated from the dismantling process. The majority of material derived was classified as C&D (Construction and Demolition) which was brought to Stoughton Recycling. Stoughton uses a state-of-the-art mechanical process to recover wood from the waste stream, which is then sorted and sized into a specified bio-fuel for a regional wood-fuel-derived power plant. We were able to extract and salvage a number of sizeable wood timbers from the truss system that we sent to a local sawmill. They will create new wood flooring from the one-hundred-year-old timbers. Both ferrous and non-ferrous metals are important recovery items on any job. We separate and prepare the scrap metal to market standards for resale. Mixed and dirty material has little or no value, while clean, prepared material is traded as a commodity with a recognized commercial value. Brick and concrete were also derived from the building. They enjoy a recycling value, which offsets a great deal of the cost of disposal. It is important to note that co-mingling of any of the “waste” streams greatly increases disposal costs or reduces revenue on a project of this type. We are always vigilant in our personnel training, equipment selections and market awareness to try to find the correct application of resources to reduce disposal costs or increase recycling revenues without driving job costs out of budget. Every job is different. The recycling story spans creating wood fuel from C&D, new flooring from old timber, commercially specified metal products, concrete for crushed aggregate recovery and even reusing bricks for perfect façade restoration. 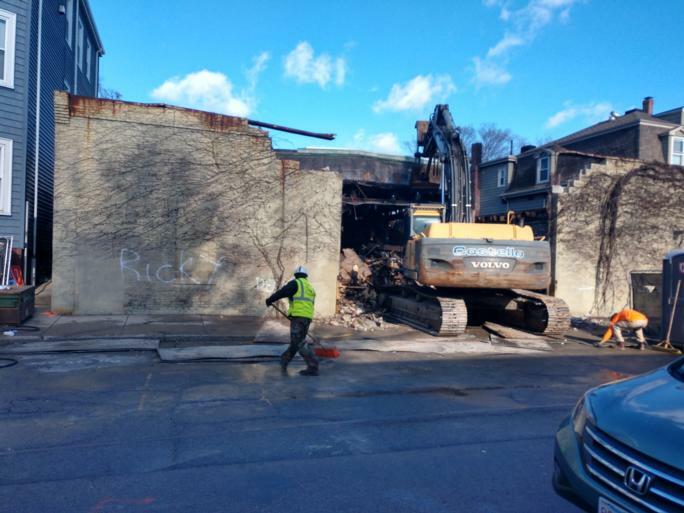 However, the demolition process is also the first step to creating a modern, adaptive residential structure within a historic, urban neighborhood. Priceless!